Like most other things in adult life, paperwork always seems to be what ‘gets in the way’ – and when it comes to recharter or wring-out, encouraging well-intentioned and actively serving adults to renew their YPT training used to be arduous. 1) REPORTING: Unit Leaders (Key-3 and their Commissioner) can now run a report that shows when everyone’s YPT will expire. Check out my earlier blog on exactly how to run the report. 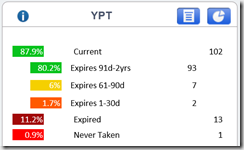 2) NOTIFICATIONS: Any adult whose my.Scouting.org account has their email address registered will be notified when their YPT is about to expire. So the easiest thing that a leader can do is print out the email roster for their unit from Scouting.org and ensure that everyone has an email address registered in the system. 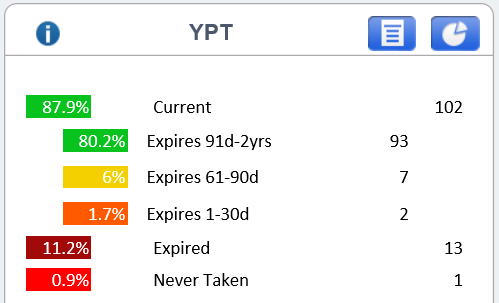 So, now both the unit leaders and the adults have multiple ways to find out if their YPT is ready to expire. 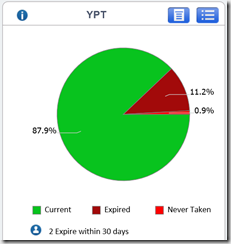 And if the adult takes the online YPT training, it will automatically update in the system. But what about those who take YPT in-person? You folks get good news too! 3) TRAINING UPDATES can now be done by your unit key 3 – they can add training to any of their adults’ records, if the adults bring proof of participation. – Look on the top of the right-pane of the screen and click on the small certificate with a green add symbol (the leftist most icon of the three). – With the class information entered, you can add one or more adults.